Great moody, beautiful dramatic landscape!! This is so fantastic view!!! I?m trying to learn about photography and this is one of my favorites books here. Fantastic contrast between the dark sky and colorful flowery field..
Perfecta armonia entre el dramatismo del cielo y el alegre cromatismo del campo. El contraste entre las dos sensaciones es fuerte, pero complementario a la vez. Magnifica la saturación de los colores. Amazing contrast of colors! The whole composition is simply magnificent! Beautiful shot, Michael! Those great colours contrasting with the gathering storm clouds really make the picture. The sky really was this dark and grey Elizabeth and there was only weak sunlight, as the lack of deep shadows indicates. It's just that this type of lighting does make colours like red look so much more saturated. It wasn't long before I got a soaking. 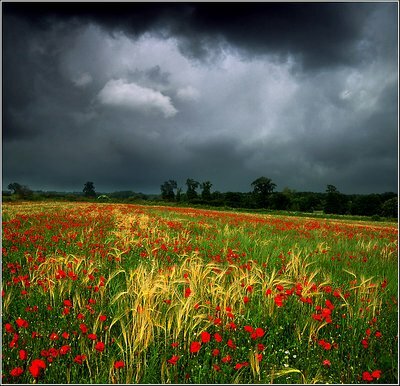 How do you get what looks like a sunny day on the flowers and a stormy day in the sky? Is it a composition? Lovely color combination between the poppies and the grasses. wow ! the red flowers work like a punch ! What a wonderful photo ... the contrast ... is really ... stunning ! The heavy sky and the vivid foreground seem almost incongruous but at the same time complimentary. The heavily saturated reds 'pop' in contrast with the dark grey. Must look great as a large print. Spectacular, a splendid image, the red jumps outside from the screen!